Behind the Gare Saint Lazare. 1932. On the Banks of Marne. 1938. Listening to Charles de Gaulle. Aubenas, France. 1961. Martin Luther King. Atlanta. 1961. Road to La Paz. 1948. Mississippi, Near Baton Rouge. 1956. From The Bus. NYC. 1958. Dody, Mary, Andrea, and Barbara. New York. 1958. Family on the Road. 1955. Bolshoi Ballet School. Moscow. 1954. Henri Matisse. Vence. France. 1944. 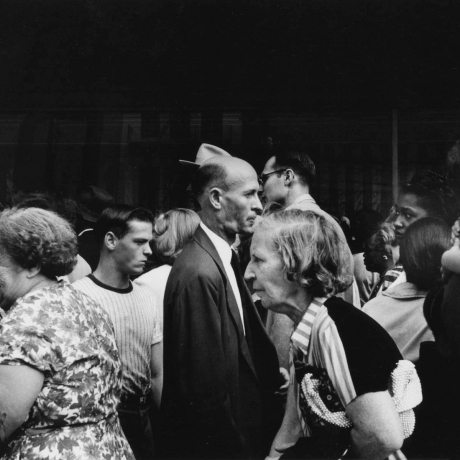 Indisputably two of the giants of 20th century photography, Henri Cartier-Bresson and Robert Frank have rarely, if ever, been exhibited together. What is particularly surprising about this is that while each stands on their own with distinctive and seminal bodies of work, they have throughout their lives been loosely associated. Within a six year period of time they published what are arguably the two most influential books in the history of photography - Cartier-Bresson’s “The Decisive Moment” (1952) and Frank’s “The Americans” (1958). They traveled avidly and were never more productive than when they were on the road, and they both shied away from any personal publicity or fame the better to go out in the world unnoticed. In a medium that by the end of the century was largely taken over by photographers looking in, they looked out. While Cartier-Bresson was 16 years older than Frank and began photographing in the 1930s and Frank started in the 1940s, each saw the world through the camera they both favored, the small light Leica. Yet clearly the camera has less to do with their output than the mind behind it. The work of Cartier-Bresson is more cerebral while Frank’s is more emotional. Cartier-Bresson’s compositional interest is harmony while Frank’s is more fractal. Cartier-Bresson tended to observe from a distance while Frank seemed eager to get close to the action. Peter Schjeldahl, writing in the New Yorker on MoMA’s 2010 Cartier-Bresson retrospective said “The hallmark of Cartier-Bresson’s genius is less in what he photographed than in where he placed himself to photograph it, incorporating peculiarly eloquent backgrounds and surroundings.” For Frank it was less where he placed himself than how spontaneous he could be. He was consistently moving in, open to possibility, immersing himself in the mystery of the moment. Rather than seeing these two artists as rivals, however, this show celebrates the pinnacle of an era where photography was still bursting with possibilities and Robert Frank and Cartier-Bresson were at the height of their artistic power, traveling the world not to see it topographically but to understand and interpret the human condition. The Robert Frank prints in the exhibition come from the Pennwick Foundation – a seminal collection of Robert Frank photographs, acquired from the artist in 1978. The Pennwick Foundation is a not-for-profit organization dedicated to broadening public awareness of art. In addition to publishing books, catalogs, and electronic media on topics including painting, photography, and film, the foundation seeks to create educational opportunities and increase access to the arts.